Above: Portland Parks is met by a restoration crew from Centennial Transition Center to do restoration at Kingsley D. Bundy City Park. Photo credit to Centennial Transition Center! 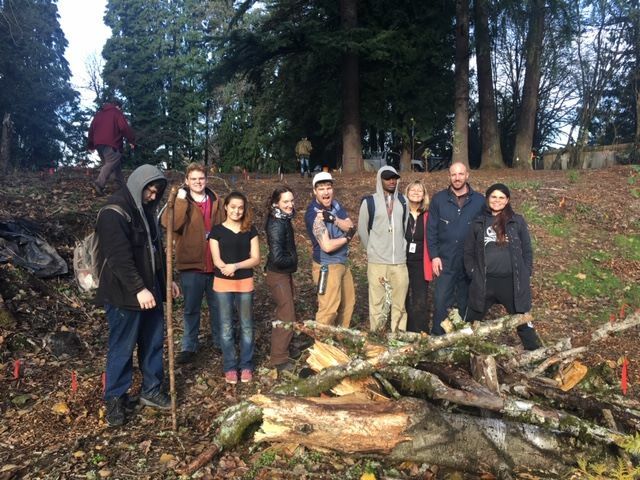 Join Pleasant Valley Neighborhood Association and Portland Parks & Recreation to plant native shrubs in this hidden Park that borders Johnson Creek. Planting native plants provides cleaner air for community members and cleaner water in Johnson Creek, which supports salmon and other fish. Everyone welcome, and no experience necessary! Wear long thick pants, a long-sleeved shirt, and sturdy shoes. Bring a water bottle, rain gear, and sunhat. Instruction, tools, gloves, water, coffee/tea, and snacks provided. Children welcome and must be accompanied by an attentive adult. WHERE: Kingsley D. Bundy Park, SE 141st Avenue and Claybourne Street. Meet at the end of SE 141st, a gravel/dirt road, just south of Foster Road. There is no available parking on SE 141st. Park on SE 142nd south of Foster Road—take care not to block neighbors’ driveways—and walk to SE 141st. WHAT: Planting 150 “bareroot” native shrubs to provide wildlife habitat & picking up litter, if time allows. Wear long thick pants, a long-sleeved shirt and sturdy shoes. Bring a water bottle, rain gear and sunhat. Tri-met bus: There is no nearby Tri-met access. Bike/Walk on the Springwater Corridor trail: www.PortlandOregon.gov/parks/springwatermap. Exit trail at the SE 145th St. entrance and ride south to Knight Street, then west on Knight to SE 141st, then south (left) on SE 141st, crossing Foster Road and continuing to the end of SE 141st. Use extreme caution crossing Foster Road! For more information contact Stewardship Coordinator Susan Hawes:[email protected] or 503.823.6131. Day of event call/text Susan: 503.823.5937. This property was donated to the city by Mr. and Mrs. Kingsley D. Bundy and their daughter and son-in-law, Mr. and Mrs. Fred Van Raden. Bundy, a mailman of 41 years, had dreamed of one day giving the land so that others could enjoy this forest along Johnson Creek. Ecological enhancement of Kingsley D Bundy Park provides cleaner air for community members and cleaner water in Johnson Creek, improving salmon and lamprey habitat. Please RSVP so we know how many to expect.